If you’re a vegetarian and would like your children to also eat a meat-free diet, there are a number of considerations you’ll need to make. 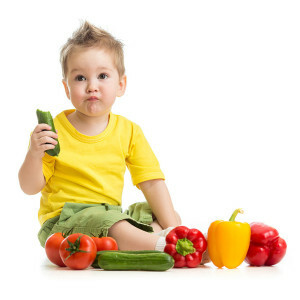 These include the variety of foods, ensuring meal times are fun and appealing to young eyes and taste buds and perhaps most importantly of all that everything they eat contributes to a balanced and healthy diet as their bones and bodies grow. Children certainly eat with their eyes and for the most picky, meal times can be a challenge – even more so if you’ve changed to a meat-free lifestyle. The key is to ensure the food looks colourful, smells fantastic and that they have a smile on their face when they see the food being served. For young children, a great way to introduce them to vegetables is to create different ‘pictures’ on the plate using the food. A face is a popular choice or perhaps a train created with different vegetables and rice with baked bean ‘smoke’. Everyone needs to eat a good balance of protein, carbohydrates and fats but it’s particularly crucial for young children and teenagers. They have to have food to fill them with energy, which isn’t full of harmful fats and gives them the protein they need to aid growth. A great solution is to start using Quorn products which is may of mycoprotein. They are a great way to introduce children to vegetarianism as there’s such a range to create meals from. If you want to ease them into the lifestyle with meals which look just the same as ones with meat then Quorn mince is fantastic for shepherd’s pie, lasagne, spaghetti bolognaise and chilli con carne. It’s a great source of protein so you’ll have the peace of mind that it’s the perfect addition to any meal for younger members of the family; here’s lots of facts and ideas for meals for every night of the week. All children love treats and snacks and it’s at these times that Quorn is just as versatile. The range of ready to eat products now includes fantastic breaded nuggets, pies, pasties and slices and for their lunch box you can fill chunky wholemeal bread with chicken-style slices and pop in a couple of surprise meat-free mini savoury eggs. Add some tasty homemade hummus and some sticks of brightly coloured red and orange peppers and your children will be the envy of their friends and lunch and snack time. Quorn has been available for 30 years now and continues to grow in popularity for all the family; http://www.quornfacts.com/ .